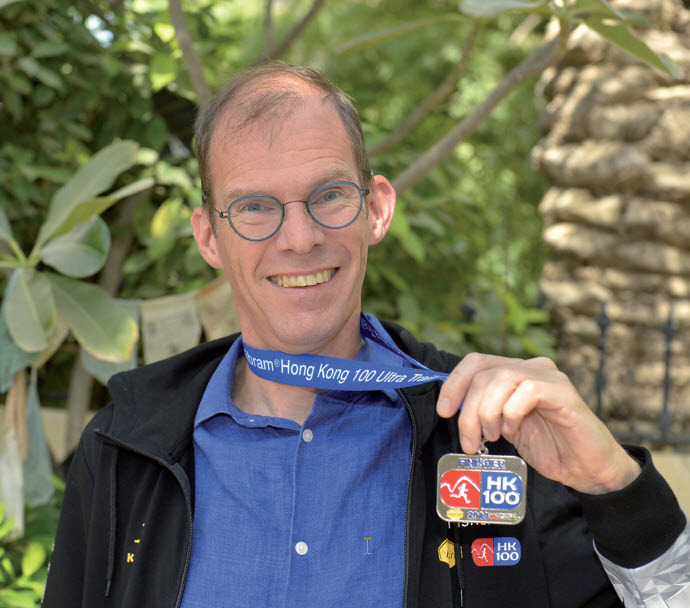 The Dutch superhuman, known to friends and family as EJ, participated in the Vibram Hong Kong 100 Ultra Trail Race last month and finished the 103km course in a staggering 24 hours, 21 minutes and 12 seconds. The 52-year-old lives in Jasra with wife Ellen and son Pim, a student at the British School of Bahrain. Their eldest son, Floris, who also attended BSB, is currently at Glasgow School of Art studying architecture. His decision to take up ultra-long distance running came from his dissatisfaction of ‘just’ finishing marathons and he said: “I’ve been running for a number of years, since I was back in the Netherlands. I started out doing 10km but continued to beef up the distances and completed a number of marathons, with my best time being three hours, 19 minutes in Rome. “However, to be brutally honest and with the greatest respect, I find running normal marathons boring. They’re usually a straight, flat road with familiar sights all around. I wanted to push my boundaries and explore something more exciting. The Hong Kong 100 is an ultra-endurance race, starting in Pak Tam Chung on the Sai Kung Peninsula and covers some of the most beautiful scenery in Hong Kong, including remote and unspoilt beaches, ancient forests, nature trails, reservoirs and steep hills. The course is based around Hong Kong’s famous Maclehose Trail, but with some diversions to ensure that runners spend more time in its most scenic sections, as well as finishing with the descent from Hong Kong’s highest peak, Tai Mo Shan. The course involves a cumulative elevation gain of more than 5,300 metres and the cut-off time is 30 hours. Of the 2,000 people who signed up, 1,842 from 57 different countries actually made it to the start line, and of those only 1,292 (70.1 per cent) finished the course within the cut-off. 33 males finished within 13.5 hours to be classified as ‘Elite’, whilst 27 women finished within 16 hours to achieve the same classification. In total, 142 finished under 16 hours to be awarded Gold, 240 crossed the line sub-20 hours to achieve Silver, whilst 404 powered through within 24 hours to claim Bronze. The remaining 504 finishers who beat the 30-hour cut-off time were awarded a medal. The overall race winner was Shen Jiasheng of China, who crossed the line in a staggering 10:22:02. EJ, who works in Saudi Arabia as a project developer, started his intense training throughout the tough summer and into the kingdom’s more pleasant winter months. However, his plans were nearly scuppered five weeks before his Hong Kong adventure, as over-training led to painful shin splints. He explained: “Unfortunately, they are very nasty. In those five weeks, I did some running but I needed to take it easy to help in the recovery process, so I was mostly limping around. As a veteran of long-distance running, EJ set off smoothly at 8am and he hit the first couple of checkpoints, of which there were nine in total, easily. A team of 1,000 volunteers manned the stations, where runners could take on-board fluids and food. He suffered his first major mishap at the 30km mark, tripping up on some loose stones and taking a heavy fall. His hands and arms bear deep cuts and scratches which are still prominent weeks later. However, he powered on, conserving his energy on the fluctuating terrain. It was at the seventh checkpoint and the 78km mark that the thoughts of quitting seriously entered his head. Tired and shivering next to a fire, he was so miserable that he almost pulled the plug. “I was freezing and spent,” he admitted. “I was trying to catch an hour’s sleep to restore some energy, but it was impossible. Others were somehow able to just put their head down and immediately fall asleep … one runner even managed to sleep by the side of the trail as people were running past him! “I was going to throw in the towel, but I realised that it was still a considerable distance to the road to get to a taxi, so it wasn’t worth the hassle. I thought I may as well just carry on the trail and see how I go. I thought about it and focused on the 25km left and realised it wasn’t that big of a number, having already completed 78 of them. EJ was alone for many stretches of the journey, running and scrambling through the dark with just a headlamp. The beautiful views of Hong Kong along the way, particularly the sunrise with clouds rolling over the mountains, was one of his motivators to finish the course and offered him comfort. After 24 hours, 21 minutes and 12 seconds of running, power hiking and scrambling over a variety of terrains, he stumbled over the finish line, too tired to be jubilant. He had lost more than four kilos and was drenched in sweat and dirt. He then took a taxi back to the hotel where Ellen, who had followed his progress on an online tracker, was waiting for him. He walked into the shower and promptly fell asleep mid-wash. Understandably, he had never been so tired in his life. He explained: “I was curious about how my body would respond to something like this and I didn’t know what to expect. I found that I was more skilled than I thought at managing my energy. “In fact, I believe I could definitely have got a time of under 24 hours if I had more experience. For example, I conserved energy earlier on because the elevation map temporarily tattooed on my arm showed that the end of the course was the steepest section. However, it turned out to be a smooth, paved road which is so much easier than a technical hill, that while smaller in height, is so much more difficult having to scramble up on loose stones. After returning to Bahrain, EJ was feverish for a few days due to the fatigue and extremities his body had been through, and it took almost a week to regain his appetite. He has resumed slow running and has mainly stuck to cycling in the gym to get the muscles working again. His usual schedule is running 80-100km a week, including one or two longer runs lasting three-to-five hours. He makes sure to complete a marathon distance every weekend, although, after his negative experience of over-training, will not push it further. ‘Getting out on the roads’ is one of his main pieces of advice to any potential long-distance runners. Whilst he believes treadmills are useful for hill training, particularly in a country such as Bahrain with very few natural hills and valleys, he describes them as ‘incredibly boring’ and will soon extinguish any desire to maintain the hobby. Instead, he advocates taking part in regional trail runs in the UAE and Oman, which are frequent and start at 30km, going up to as much as 60km. As for EJ himself, surely achieving the 100km goal would be the peak of his ambitions? Not a chance, it would appear.